NOTES: New tool kit that includes two full kits. The North American X-15 rocket-powered aircraft/spaceplane was part of the X-series of experimental aircraft, initiated with the Bell X-1, that were made for the USAAF/USAF, NACA/NASA, and the USN. The X-15 set speed and altitude records in the early 1960s, reaching the edge of outer space and returning with valuable data used in aircraft and spacecraft design. As of 2012, it holds the official world record for the fastest speed ever reached by a manned rocket-powered aircraft. During the X-15 program, 13 different flights by eight pilots met the USAF spaceflight criteria by exceeding the altitude of 50 miles (80 km) thus qualifying the pilots for astronaut status. The USAF pilots qualified for USAF astronaut wings, while the civilian pilots were later awarded NASA astronaut wings. Of all the X-15 missions, two flights (by the same pilot. Joe Walker) qualified as space flights per the international (Fédération Aéronautique Internationale) definition of a spaceflight by exceeding 100 kilometers (62.1 mi, 328,084 ft) in altitude. That maximum speed set by the X-15 was 4,519 mph at an altitude of 31 miles by Pete Knight. This is another of Dragon's nice two packs and has two identical kits. Like some of the more recent kits, this one has a complete, hollow, fore and aft fuselage. 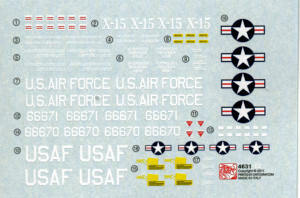 It is obvious by the additional canopy pieces on the clear sprue that other X-15s will be kitted. This one is of the initial types with one being the first prototype and one being the one that made the first powered flight. As you can see by the sprues diagram, there is not all that much to the kit. Fortunately, Dragon has provided the option to build the kit either on its landing gear or in flight. Unfortunately, they did not include a display stand for the in flight version as they did with the X-1. However, resourceful modelers with the X-1 kit can built one X-1 and one X-15 in flight and use that display stand as it holds two aircraft. The kit includes a fairly nice cockpit of which almost nothing will be seen through the tiny cockpit windows. For the in flight mode, there is a separate lower fin piece that was used. For the ground mode, that lower fin can be left off as it was jettisoned upon landing. Then one can either use the rear skids for display or use the wheeled trolley that was used to move the aircraft around on the ground. Instructions are rather basic with only two construction steps, but enough to show all the bits. No interior colors are provided, but I do believe black would be appropriate. Decals are well done and should provide no problems. The color and placement guide is on the back of the box. One thing that brought a smile to my face was the reference to the 'taxiing position' when referring to the ground mode build. Another very nice twin set from Dragon and a nice addition to their growing space/experimental selections. 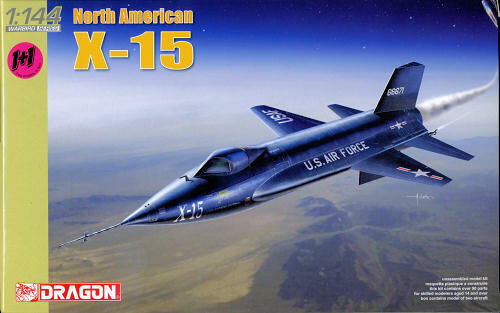 Judging by the way the molds are done, I would not be surprised to see later X-15s, including the longer X-15A-2 versions. Thanks towww.dragonmodelsusa.com for the preview kit. Get yours today at your local shop or have them order it for you.